Nimbus Hosting Review 2019: Is Nimbus Hosting a Good Hosting? Founded in 2011, Nimbus Hosting focuses on providing hosting primarily for resellers. They have a solid uptime service level agreement, lots of positive customer reviews, and excellent customer service statistics. Hosting provider Nimbus Hosting was founded in the U.K. in 2011. They focus on providing hosting for agencies who resell it to their clients. They have a solid uptime service level agreement, lots of positive customer reviews, and excellent customer service statistics. Their website and support are available in English. Nimbus Hosting colocates its servers in an ISO 27001 certified Tier III data center in North London. They don’t own the center, but they do own and manage all of their own servers, and they have 24/7 monitoring. Their really solid uptime service level agreement commits to 99.995% uptime for infrastructure, network, and hardware. The four STORM cloud hosting packages – named Helium, Neon, Argon, and Oxygen – include from 2GB to 8GB memory, 30GB to 100GB SSD storage space, and between 4 and 8 cores according to the chosen plan. All plans come with onsite backups, and you can get off-site backups at additional cost. The three dedicated server packages – named Troposphere, Stratosphere, and Mesosphere (are you spotting a pattern?) – come with 8- or 10-core processors, up to 64GB memory, up to 2 x 480 GB SSD RAID 1 storage, and up to 10TB bandwidth. All dedicated server plans come with five onsite cloud backups, optional offsite backups (for a fee), and 1-hour hardware fix promise. The cloud plans and the dedicated server rentals both come with a single dashboard, a one-click installer, a Let’s Encrypt SSL certificate, and WordPress 30-second installation, plus Git deployment and the option to whitelist IPs with one click. Nimbus Hosting’s plans are pretty hefty and are only designed for their target market of agencies looking to resell hosting to their clients. With that in mind, there are very few companies to compare Nimbus Hosting against. But compared to other cloud and dedicated server companies, their prices are in line (if a little on the high side for the dedicated servers). All plans come with a 14-day free trial, and they can be purchased on one-month, three-month or annual terms. There is quite a high setup fee, and you might also have to consider the 20% VAT on top of all prices if you’re a personal customer who can’t claim back the VAT. Domain registration also costs extra, but you get a free Let’s Encrypt SSL certificate with all plans. Upon checkout, the customization options are quite limited. Customers can choose the operating system (Windows, Linux or STORM) and the control panel (Plesk, cPanel or STORM). You can upgrade or downgrade at any time. Customer service couldn’t be better during business hours but unfortunately is not 27/7 support. You can contact this company via email, telephone, ticket or live chat, and I have found them to be both prompt and helpful. In fact, the operator was good fun and knew when to switch out of sales mode. They respond to 97% of tickets within one hour and 87% of tickets within four hours. If you prefer to solve your issues yourself, there is an extensive knowledge base and a network status page. Nimbus Hosting is designed specifically for agencies who want to sell hosting to their clients. 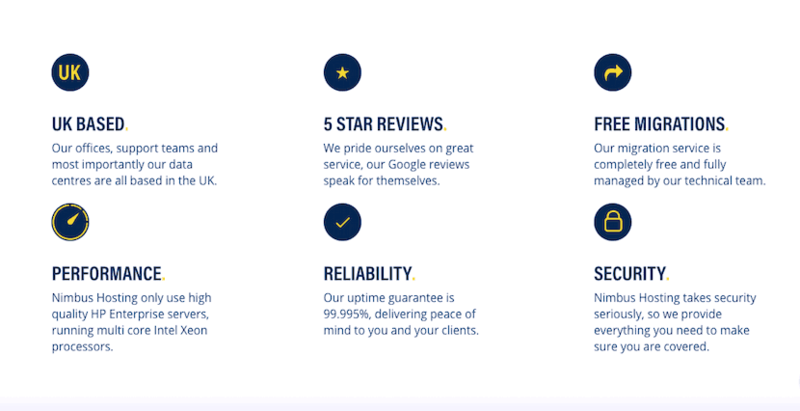 As such, it won’t be suitable for all website owners, but large agencies needing top-of-the-line hosting on UK servers should certainly review Nimbus Hosting. Wondering how Nimbus Hosting stacks up against other Web Hosting companies? Enter any other Web Hosting company and we will give you a side-by-side comparison.